Join us in celebrating English apples and cider on the 25th anniversary of the Big Apple – a real opportunity to enjoy the autumn countryside in this corner of Herefordshire in and around Much Marcle. We have put together for you a collection of small rural events where you can enjoy our local orchards, famous for their cider fruit and excellent eating apples. Your programme is entirely flexible – you can choose where and when to go for an afternoon, a day or a full weekend. You can simply come for a walk or to buy some apples. Or you can fit in several different events. 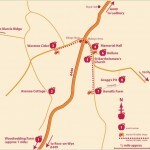 The map and programme of special events will help you to plan your visit. Of course you can use your car to get around. But you may like to know that many of our venues are in walking distance of each other, and cycling is also a great way to get about. A tractor and trailer service, kindly provided by Westons Cider, will be running all weekend carrying visitors between six of our venues. See map for route and stops. The service is free but donations will be welcome. Experience The Big Apple – all of it! Look out for our special Big Apple Trail card. For just 50p, purchase a card from any venue when you arrive. At each venue you visit, you can collect a stamp for taking part in a simple activity. Collect four or more stamps from different venues during the weekend and you can enter a prize draw to spend a day with one of our cidermakers.